Your pharmacy does far more than just fill prescriptions. You are a trusted provider of critical healthcare services in your community. This is obvious to you and has been for some time. But it’s not necessarily obvious to all of your customers or the general public. Many people still think of a community pharmacy only as the place they go when they need to fill a prescription. You want them to think of your pharmacy for more. Changing this perception takes constant effort. Here’s a great opportunity to show that your pharmacy focuses on community health and to promote your pharmacy’s broad range of health-related products and services. World Health Day is sponsored by the World Health Organization and it began in 1950. This year’s celebration will be held on April 7th. It is a global event focused on improving the health of everyone in the world. 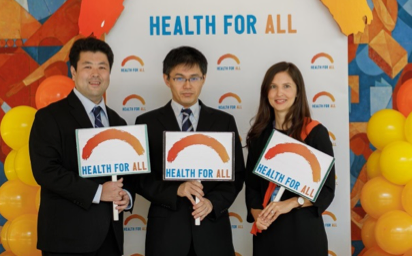 World Health Day’s previous themes have focused on topics such as universal health coverage, diabetes care, maternal and child care, and mental health. So what does World Health Day have to do with your pharmacy? Supporting World Health Day provides an opportunity to celebrate health and to promote everything your pharmacy does to keep your community healthy. In particular, it provides an opportunity to highlight your prevention and wellness activities. Have in-store signs and announcements saying, “We support World Health Day.” You can hold special events like screening for high blood pressure or discounts on point of care cholesterol tests (see Opportunities in Point of Care Testing). Mention World Health Day on your website, Facebook page, and other social media. Provide a reminder of your wellness-focused and preventive services. You can also offer appointments for comprehensive medication reviews and can enroll patients in med sync. Write an article for a local newspaper or be a guest on a local radio or television show. Do outreach to local media about World Health Day and describe how your pharmacy is using this occasion to increase awareness about your many health-related services. Arrange an interview with a local reporter to focus on community health and explain your pharmacy’s role. Do outreach to local providers and other community businesses. Let them know about World Health Day and how your pharmacy will be highlighting various preventive services, including immunizations and various screenings. Since World Health Day is unique, global, and has a positive message, it provides the type of stories that media outlets like to feature. You can explain how your local pharmacy fits in with this global undertaking. By showing your support for World Health Day you can remind your community of all the valuable ways that your pharmacy does more than just fill prescriptions. You are a partner in prevention and wellness, and in improving the health of the entire community.